The Big Wobble: Birth Pains and earthquakes in diverse places: The absolutely astonishing growth of major earthquakes in just one hundred years! 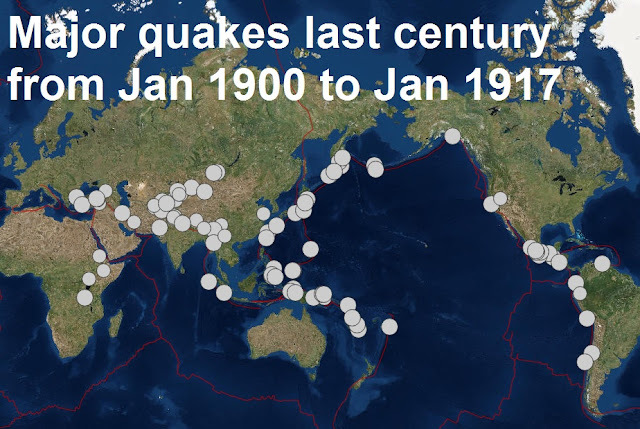 Birth Pains and earthquakes in diverse places: The absolutely astonishing growth of major earthquakes in just one hundred years! Matthew 24:7 states: For nation shall rise against nation, and kingdom against kingdom: and there shall be famines, and pestilences, and earthquakes, in divers places. There will be great earthquakes, famines and pestilences in various places, and fearful events and great signs from heaven; this was written 2,000 years ago, by Luke the Evangelist who was quoting the warnings of Jesus Christ. Famines, pestilence and fearful events are very much a part of our life these days and as for signs from heaven, last year we were blessed with blood Moons and Super Moons, Sun and moon eclipses, fire balls, comets just to name a few. But it’s the earthquakes statistics which I find jaw-dropping, this century, from January the 1st in the year 2,000 until January 2017 a total of 2,697 major quakes have been recorded. 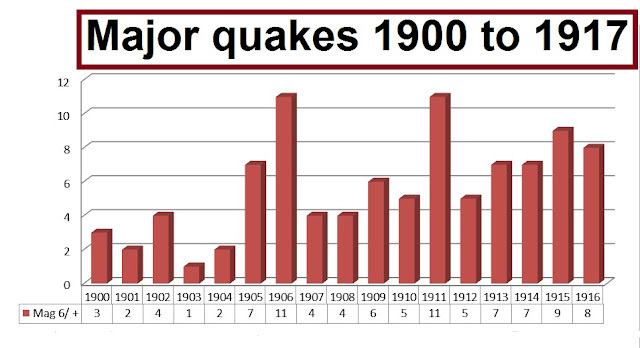 In the same period, January the 1st 1900 to January 1917 only 97 major quakes were recorded, that is an incredible increase and indicates our planet is showing signs of birth pains because just as a woman in labor suffers contractions of increasing pain and intensity likewise our planet is also suffering with increasing quake pain and intensity. And with wars and rumors of wars it is safe to conclude Jesus’s warning and prophecy would place us somewhere in the last days. In 2011, the year of the mag 9. Fukushima disaster in Japan our planet suffered 208 major quakes compared to 1911 when just 11 were recorded. May be tomorrow.... if you're not born again think about getting hold of your local church etc... why wait?! James, if you die in a car accident tomorrow, then that's it for you as to whether you were or weren't reconciled with God (through repentance, faith in Christ's death for your sins for forgiveness of sins, Christ's lordship, and baptism), and it would be irrelevant as to whether the last days and Christ's Second Coming are 50 years away or 10 years away. We always need to be ready.. I caught the last 5 minutes of the Superbowl ..... funny how things seem to end in the fourth quarter. 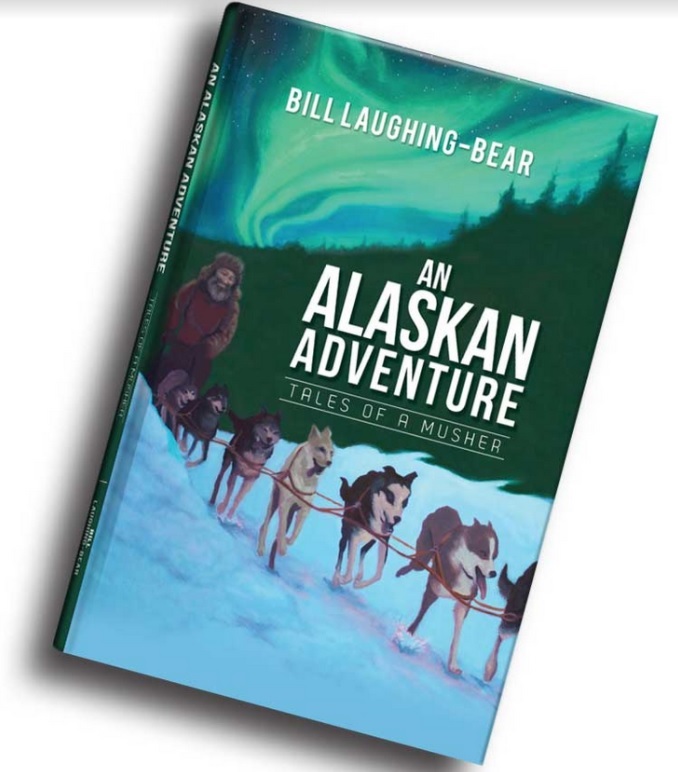 Many of us are in the fourth quarter - some deeper into it than others. Isn't it time to reconcile and get ready for the end of the game? I was sure the Patriots had lost, but - it was the fourth quarter. WHY NOT start telling the truth about whats going on in the world,NIBIRU IS COMING AND ITS COMING ANYDAY NOW,the planet will see a pole shift,do you guys want the blood of millions on you? ?you won't get into heaven if theres even ONE DROP on you,you best start warning whats really going on.. Absolutely correct! Stop blaming the sun and "massive" coronal hole pointing at us. You will surely go to hell for spreading disinformation that gets people killed! "Strange: while mag 6 to 6.9 quakes have risen over one hundred years by as much as 450% earthquakes measured at mag 7 or higher have remained increadibly stable over the same period"
Actually this is not strange, but to be expected. If you ever experienced many earthquakes, personally, in your life, then you know between 6 and 6.9, unless you are very near an epicenter, then probably you would not know one happened and in lesser populated areas, a century ago, much less populated than they are nowadays and with no advanced instant communications or scientific recording devices or satellites overhead, then 6 to 6.9 might go completely unnoticed and unreported. 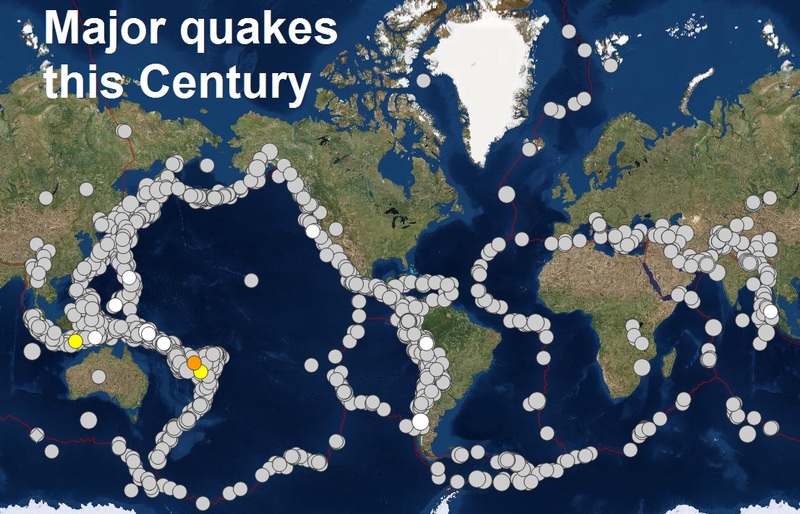 Where-as nowadays, they would not, because all the measuring devices and instant communications are in place, to record earthquakes even smaller in size, the ones close to nobody would have noticed much 100 years ago. As for the larger ones, remaining the same, that would make sense because for the larger ones, 7.0 and greater, then yes, even 100 years ago, even in lesser populated or further distanced locations, it would have been noticed by natives to those areas or more populated regions nearby, the littler ones not, the larger ones yes. 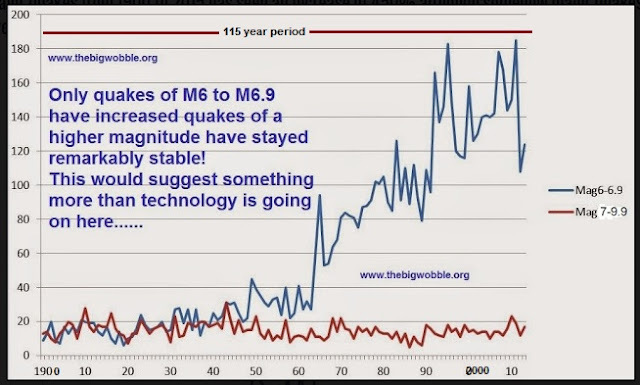 Thus this makes perfect sense and is really just a perception of increased earthquakes when it really has to do with the smaller ones not reported back then but larger ones yes, versus measuring equipment nowadays able to pick up even tiny ones, below 1.0 and smaller. 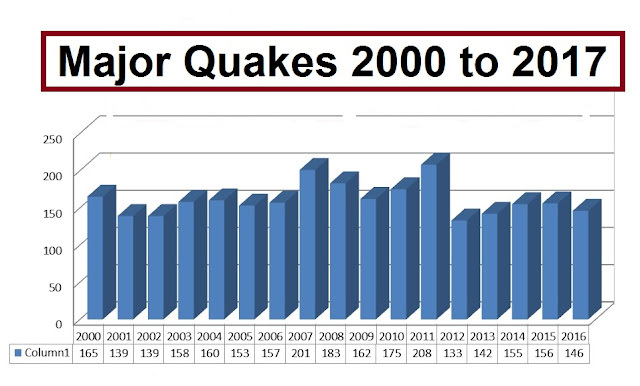 No mystery and no increase in quakes is evidenced, just by what is stated in this article. 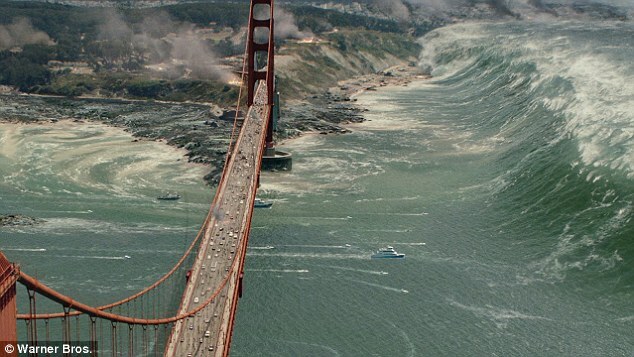 An earthquake of a magnitude between 6.0 and 6.9 will produce a massive jolt at its epicenter which will send out seismic waves that can be detected many thousands of miles away. I'm not an expert by any means but I have to disagree that the increase in the number of detected quakes over the last 100 years of magnitude 6.0 to 6.9 is merely a reflection of the placement of more seismographs around the world and improved communication. True no secret rapture. Only a fight with the two beasts coming for Christians. The 2 beasts are on earth for 3 1/2 years. At the same time Gods 2 Prophets are on earth for about the same amount of time. And where does the majority of the Christian church go? They flee to the wilderness during the riegn of the beasts also for about 3 1/2 years. My point is Adam and Eve were given paradise. We are going to earn it. Love. Elder Philip. Sorry but usgs is not a trustworthy entity anymore. their information is scrubbed and doctored a lot. In reality it is worse than they say. The key to end times Prophecy is Israel because. I will makes Jerusalem a cup of trembling and we are seeing that now and this generation shall not pass away till all these things be fulfilled that saw the rebirth of Israel. So we are on a timetable and are in the right time. The birth pain become more frequent and more intense. We do need to know where we are going to spend eternity. Obviously we have people posting misguided dangerous opinions and not acurate Scriptural facts. In the last days there will be many who are lead astray...meaning the church. Stay rooted in the word and don't throw your pearls to swine.